Many people have told us that the waiting after the referral is actually worse than the wait before you see your child's face. Both Steve and I were talking last night and agreed that wasn't the case yet. 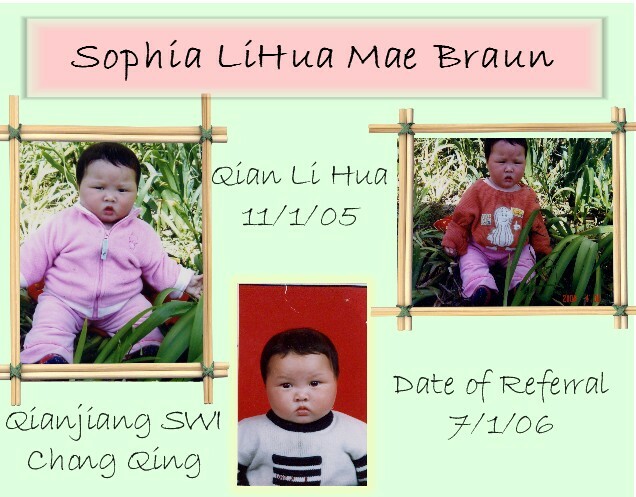 Perhaps the high of seeing Sophia's sweet, round face has not worn off yet. Maybe it is because we are busying making a book to send her in a care package we hope to mail to China this week. Maybe it is because we are getting things ready for the trip such as picking out the clothes we will bring for the baby, buying hairbows, and buying all the necessary "stuff" (advil, saline spray, sunscreen, etc) to bring on our trip. Whatever the reason, we are not complaining!!!! We hope that our travel approval comes quickly. Once it does the agency will get our consulate appointment and we will know when we will be in China. I am hoping that we will have our travel approval in two weeks and travel by August 14th. Keep your fingers crossed for us. Enjoy every moment of it. I still remember the days after our referral and they were so exciting. Our wait to travel did seem long but once we were in China nothing else mattered. Happy Packing!! Anne - this is Tina from class. I have been crazy busy and haven't stopped in for awhile and I was so pleased when I did and saw your beautiful daughters face! I am so thrilled for your entire family. Congratulations and travel safe! I'll be watching for up-dates.